On the first day of the year 1900, a small town deep in the Uruguayan countryside gathers to witness a miracle—the mysterious reappearance Pajarita, a lost infant who will grow up to begin a lineage of fiercely independent women. Her daughter, Eva, a stubborn beauty intent on becoming a poet, overcomes a shattering betrayal to embark on a most unconventional path. And Eva's daughter, Salomé, awakens to both her sensuality and political convictions amid the violent turmoil of the late 1960s. 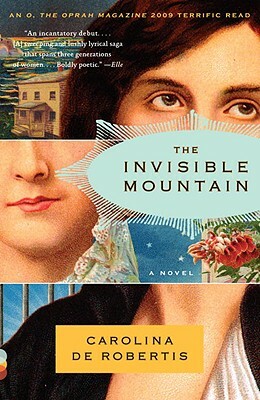 The Invisible Mountain is a stunning exploration of the search for love and a poignant celebration of the fierce connection between mothers and daughters. Carolina De Robertis was raised in England, Switzerland, and California by Uruguayan parents. Her fiction and literary translations have appeared in ColorLines, The Virginia Quarterly Review, and Zoetrope: All-Story, among others. She is the recipient of a 2008 Hedgebrook Residency for Women Authoring Change and the translator of the Chilean novella Bonsái by Alejandro Zambra. She lives in Oakland, California.